Home » Homepage » Rezday! Nine years ago, I was completely clueless about what I was signing up with. I think I’ve told my tale a billion times, but, for my rezday, I’ll tell it once again. My roomie and I were far away from home on exile. We had been tracked via the Internet by some rough guys who applied extortion to us; we had to leave and let the police take care of them (yes, they have completely vanished and eluded the justice after we filed our complaint). I shut down most of my Internet presences by then, just leaving the company email active, as well as my 17-year-old personal email. I stopped participating on forums, on ICQ, MSN, and whatever sites I had been registered with; Facebook didn’t exist yet, but there were others. Back then I already was a full-time telecommuter; in fact, I had been one for almost a decade. Some of my colleagues at work just noticed I wasn’t physically around in the same city — we were 1000km away by then — after a month. So, yes, I guess I can claim I was quite familiar of being just a virtual presence and still do useful work that day; in fact, the office I used to work with is still around, they sometimes still give me something to work upon, but nowadays over half the people there are telecommuters. And today I’m continuing my academic studies at a university 450km away from home. Once you start detaching yourself from the notion that “physical presence is important”, it’s hard to get back — even though that’s what probably will happen to me next year or so, after two decades of telecommuting. My roomie always was a big computer game fan. I have nothing against games, mind you, and still waste half an hour per day playing some simple strategy multiplayer games. But back in 2004, I thought it would be nice to “play” something together with my roomie in our spare time — we had lots of spare time back then. The problem was, we wanted something that would engage us for a bit more than a few months. And I’m a Mac, she’s a PC, which narrowed down the choices in terms of computer games. Wildly searching for keywords like “3D, game, strategy, multiplayer, Mac, Windows” somehow pointed me to an article on an old Apple site, which used to feature articles about innovative products launched for the Mac platform (sadly, Apple stopped doing those articles, long long ago). Linden Lab had done a major rehaul on Second Life in June 2004, launching user-generated animations, XML-RPC communications and… a Mac viewer. I couldn’t understand two thirds of what the article was saying, but I thought it would be nice to try it out — it was free for a week, and subscription-based after that. 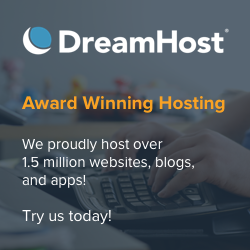 A business model that still earns Blizzard a billion US$ every year, and one wonders how SL would have evolved if they kept that business model around. I wasn’t a complete newbie to virtual worlds with user-generated content — I had tried out ActiveWorlds when it was still known as “Alpha World”. I remember being dropped on a completely empty region with a dozen or so other standard avatars. Everything was an uniform shade of gray. “Now what?”, people were asking in chat. Well, apparently the creators expected people to provide the content — working for free. Laughable. I disconnected and never tried ActiveWorlds again. Second Life, by contrast, in late July 2004, already had tons of content. It was just much later that I found out that there were just five thousand residents back then, but they had already created a huge environment. It was already impossible to see everything. And that was precisely what I tried to do in the 16 hours of my first session — 90 minutes of which were spent creating my first — and only — avatar. Then I slept for four hours, and logged in another 12 hours non-stop. Ironically, my roomie was not much impressed, although she was, back then, an architecture designer. And I thought we could change our names, so I just selected something deliberately tongue-tying. Why? Because I most certainly wasn’t interested in having another online presence that could be easily tracked to us. I didn’t expect to last much more than fifteen minutes; that’s about the time I usually survive on a new game. There are very few exceptions, and that’s why I don’t play many games, but, once I start playing them, I tend to be very faithful. There has to be some “magic” that captures my attention. This is why I’m still fond of playing Sid Meyer’s Alpha Centauri — a strategy game from 1999 which never had a sequel, even though the community still releases occasional patches to let it run on more recent versions of Windows. It’s a game for which I own three licenses — Windows, Mac and Linux. Unfortunately, there are no more Mac versions — I actually ordered the last existing copy for Mac (or so they assured me), and, due to its rarity, it was stolen at the post office (bummer!). I can still play it via a software emulator — in fact, that’s the only reason I own an old copy of Parallels, just to be able to play Alpha Centauri occasionally 🙂 Of course, my roomie, being a veteran player, still plays it some 2-3 hours every day… when she’s not busy building in Second Life (or, rather, on OpenSimulator). Somehow, however, I was fascinated by the zillion sliders to create your own avatar. It felt like magic, and was a completely different experience from anything I had seen so far. I had no previous experience with 3D tools — it was just many months afterwards that I understood that Linden Lab just got their inspiration from Poser (which LL used to create the default Linden animations), but made it simpler. There was a certain je ne sais quoi about Second Life which captured my whole attention. Again, it was much, much later when I understood what it was, and why the vast majority of the human population on this planet will never become a regular SL resident: it’s the spark of loving to learn how to do things. And there was certainly a lot to learn: it took me two days to understand how to link two prims together! I knew it was possible, because I could watch people doing that on the sandboxes, but I was clueless about how to replicate that. I remember that I met someone on my first name (I can’t even remember her name now), and we spent endless hours on the outskirts of the sandboxes desperately trying to link prims together. Finally, one of us figured out the command that would do just that (I can’t remember who figured it out first! ), and we both bathed in the glow of accomplishment. Yay! We learned how to build! Shortly afterwards I managed to break apart one of the standard Linden gaslamps (I think we all have one of those in our Libraries, but I haven’t checked), and there was a surprise inside: this virtual world was scripted. We could not only design our own avatars, build things, but we could also programme our creations! My first stupid thing was getting some light. You see, I didn’t know that we could change the day/night routine. I thought it was fixed, and, since I was half a world away from LL’s HQ, I thought I was condemned to see the whole world in perpetual darkness. So having a lamp to help me to see what I was building was crucial. This now sounds so stupid that I can only laugh at my ignorance and innocence back then! Friendly Linden Helpers would drop clothes on us, and this made me understand the potential of SL as a huge virtual marketplace. In the next few weeks, I wanted to learn everything. I got the templates to design my own clothes, because the freebies were, well, horrible. Not that the “commercial” clothes were good; but I couldn’t afford them. So I thought, we need to build things and sell them, so that we can buy other things. It made some sense. So I did clothes, and scripted cigarettes, which required custom animations, which led me to create a precursor to what would be called an “animation overrider” a few months later, and I was even in the process of designing a web-based marketplace for SL when SL Exchange (later XstreetSL), the forerunner of the current SL Marketplace, was launched — my work was still unfinished, so I gave up on it. I have to say that I was completely fascinated. I would love to say that the picture on this article is the picture of my first day in SL. Unfortunately, it’s not — it’s from my fifth day, because I had no clue how to take pictures before that, and, when someone explained to me how to do that, I found out that it cost L$10 to upload a picture to your profile, so, well, I wasn’t that fond of taking pictures. Later I found out that you could save them to disk for free — ugh! Well, the difference between the Gwyn on July, 31st, and August, 4th, is not huge. But there is a substantial difference: while wandering on one of the sandboxes, amazed with what people were able to build back then, someone was offering roses to all the girls there. I put one in my hair — and never stopped wearing one since then. It’s strange how these things happen, but, you know, it sort of made sense to me: Linden Lab is headquartered in San Francisco, and if you’re going to San Francisco, be sure to wear some flowers in your hair 🙂 It makes sense, right? Well, it did for me back then. It’s impossible to condense the experience of nine years in just a single article. My blog was launched a few days after that picture was taken. There were few blogs exclusively for SL back then (and I wonder how many are still around), except for the then-Linden-sponsored New World Notes, and I thought that it would make sense to keep a record of useful tips and ideas for new residents, so that they wouldn’t need to take so long to figure out things as I was forced to do 🙂 and jump straight into the action. Not many months afterwards, the SLogosphere exploded with all kinds of blogs, forums, and websites with far more information that I was able to supply, so I quickly gave up that focus and started to write… well, about pretty much everything, I guess. 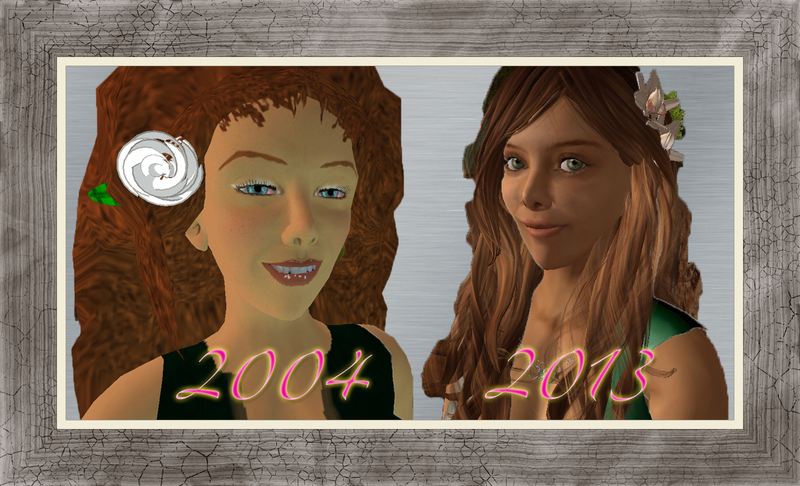 Oh, and yes, my 2013 avatar has practically the same shape as my 2004 one. I know it looks very different, but that is mostly the skin (we just had those yucky “rubber” Linden skins back then) and the lighting from a modern renderer. And, of course, we have far better hair and meshed clothes these days 🙂 There is actually a good reason for sticking to the same shape — I can bring it over to pretty much every OpenSimulator grid I’m forced to register with 🙂 So, yes, I look pretty much the same everywhere in the Metaverse. And, to be honest, I’ve grown used to that shape; any other would simply not be “me” — whoever that “me” is.